The teaser for actor-filmmaker Ravi Babu’s long-delayed experimental flick, Adhugo, was unveiled a few days ago and received a decent response. The film has been in the making for the last two and a half years. 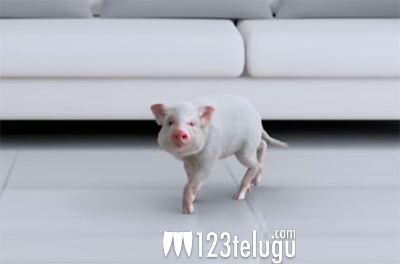 The film’s story is centered around a piglet named Bunty, and a lot of high-end VFX work went into the making of this piglet. Now, the latest reports revealed that Adhugo makers have started a pig farm for all the 150 piglets used in the movie. Ravi Babu said that he had to use 150 piglets since piglets grow very quickly and that the difference can be felt within a few days. So, with each piglet, they would shoot only for a couple of days and then shoot with another piglet. Suresh Babu is presenting Adhugo. The film will be hitting screens during the upcoming Dasara festive season. The film will feature high-level 3D animation and VFX.